To read the original post, please click on the date stamp or ‘…more words’. I suppose you’ve already had your own fun experiences with the new WP reader. Clicking onto the post title opens a silly uniform window, from which you can then go to the original post if you haven’t lost interest in the meantime. Maximum user friendliness, or is it? Anyway, if you haven’t read this elsewhere, there is a way to work around that now. After the word count is back, you can click either there or onto the date stamp (clock symbol) in the lower left which will lead you directly to the post. Also, my stats have gone down the drain since then. I’m hardly getting any visitors at all on most of my blogs since the change. There are more clicks from the WP search engine that scans my blogs for an update of the ‘My Blogs’ page than actual visitors. There were some clicks on this blog, so although this post isn’t what I write about usually around here, the might be a slight chance that someone might read it. I suggest to all of you who also dislike the new reader, or if the reader doesn’t work or seems bugged on your mobile equipment to complain at the ‘Forums’ page. There’s a sticky post right on top called ‘Reader changes’. (Go to your ‘Stats’ or ‘My Blogs’ page and scroll down to the bottom, it’s in the ‘Community’ column.) The more the better. It seems a lot of people are now switching over to Bloglovin to use as an alternative for the WP reader. I’ve learned it also shows the entries that are slipping through the meshes of the WP reader’s net. As I haven’t taken a look into this yet, I cannot personally recommend this, but it might be worth giving it a try. One more thing to take care about: There were some rumors in the forums that the ‘links’ widget is going to disappear which has obviously already been tested as some people complained about it. As collecting all those links has been some work for most of us, I can only recommend that you already take care to save them somewhere else, may be on a links page. I’m working on mine already (currently set to ‘private’). The Ten Stitch Blanket I started had to be frogged. For some reason I kept losing more and more rows so that the blanket began to look more like a funnel. I couldn’t find the reason, maybe I skipped a row or another at some point. 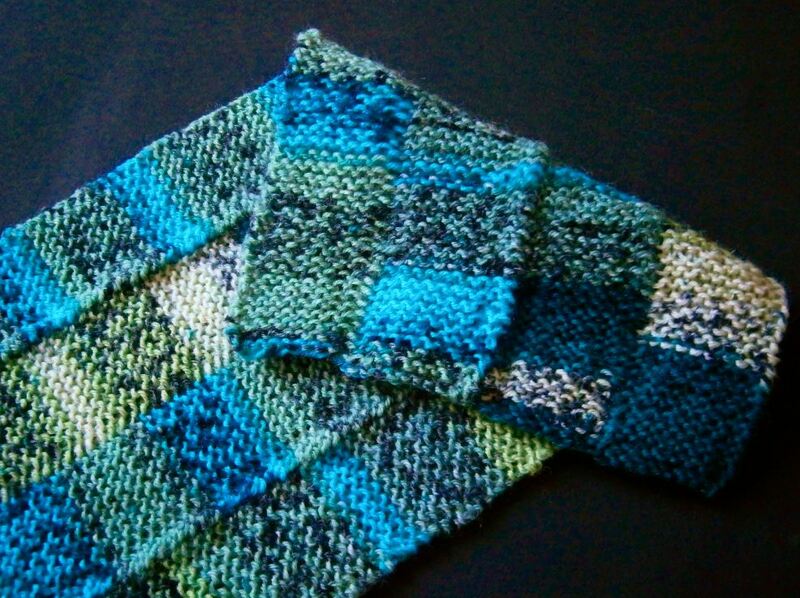 Instead of knitting around the corner, I’m now knitting straight strips. This seems to work, as pictured above. Testing the Ten Stitch Zigzag only worked with the first strip. After I began joining the second strip the look was less pleasant, to say the least. I didn’t take a picture as it was too frustrating and frogged that too. I’m now testing a straight Twenty Stitch, maybe I’ll try different numbers of stitches in the next rows (five or ten).